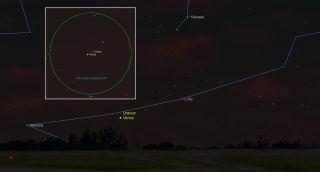 In the western early evening sky of Wednesday, March 28, our sister planet Venus will pass only 4 arc-minutes from the distant blue-green ice giant planet Uranus. Binoculars or telescopes will be needed to see dim Uranus next to Venus' bright glare. The two planets will easily fit within the field of view of a backyard telescope. The best time to see the pair comes after the sky darkens around 8:30 p.m. in your local time zone. Have you ever seen two planets close together in the same high-power telescope field of view? This can be done Wednesday evening (March 28), when Venus, the most brilliant planet, closely snuggles up to the seventh planet from the sun, Uranus. In the 2018 "Observer's Handbook" of the Royal Astronomical Society of Canada, contributor Murray Paulson refers to this as a "fantastic conjunction." Venus will pass only 4 arc minutes (0.066 degree) south of Uranus. That's only about one-eighth of the apparent diameter of the full moon. Or put another way, if you look at Venus through a telescope, the distance between it and Uranus on Wednesday will be equal to the disk diameter of Venus times 23. Beneath those clouds are two worlds with odd characteristics. In the case of Venus, it takes longer for it to make one full turn on its axis (243 days) than it takes for the planet to make one full circuit around the sun (225 days). (Earth takes one day to turn on its axis and one year to orbit the sun.) In addition, Venus rotates backward, compared to the other planets — from east to west. So the sun would appear to rise in the west and set in the east, if you could somehow see it through Venus' cloud-covered sky. The odd thing about Uranus is the tilt of its axis with respect to its orbital plane. All the other planets are tilted somewhere between 3 degrees and 29 degrees. But Uranus is tilted almost 98 degrees. That means that during its 84-year trip around the sun, it looks like it's rolling through space on its side; at times, we might see one of its polar regions pointed almost directly toward us, while at other times, we might see it with its equatorial zone stretching nearly straight up and down, instead of across. Because of what's called a "runaway greenhouse effect," Venus is recognized as the hottest planet in the solar system, with an estimated surface temperature of 863 degrees Fahrenheit (462 degrees Celsius). In stark contrast, Uranus possesses the solar system's coldest planetary atmosphere, at minus 371 degrees F (minus 224 degrees C). Wednesday's close approach between the two planets will be a convenient opportunity for you to identify Uranus in a small telescope or binoculars without using a sky map. Finding Venus will be no problem: Just face due west shortly after sunset, and you'll see Venus shining brightly through the twilight. Uranus will appear to the upper right of Venus. The only drawback to this approach is that you'll have to wait until the background twilight sky has sufficiently darkened for you to see Uranus. Wait until about an hour after sundown for that, but also be aware that by that time, the planet duo will be very low in the sky — only about 6 degrees above the western horizon. You should also have a perfectly clear sky; any haze or high cloudiness will almost certainly hide Uranus. Least separation takes place at 8:47 p.m. EST (0047 on March 29 GMT). Farther west, the sun will still be up, but the two planets will still be almost as close when the sky becomes dark enough for you to look for Uranus. Venus will be dazzlingly bright at magnitude minus 3.9 compared to sixth-magnitude Uranus. Its nearly full disk (95 percent illuminated) moves nearly 3.1 arc minutes per hour toward the northeast, while the more distant planet travels only about 0.1 arc minute in the same direction. Joe Rao serves as an instructor and guest lecturer at New York's Hayden Planetarium. He writes about astronomy for Natural History magazine, the Farmers' Almanac and other publications, and he is also an on-camera meteorologist for Fios1 News in Rye Brook, New York. Follow us @Spacedotcom, Facebook and Google+. Original article on Space.com.